There is something magical about crayons. Whether you’re old, young, or somewhere in the middle, creating crafts with crayons is something that we can all enjoy, if we take the time to do it. 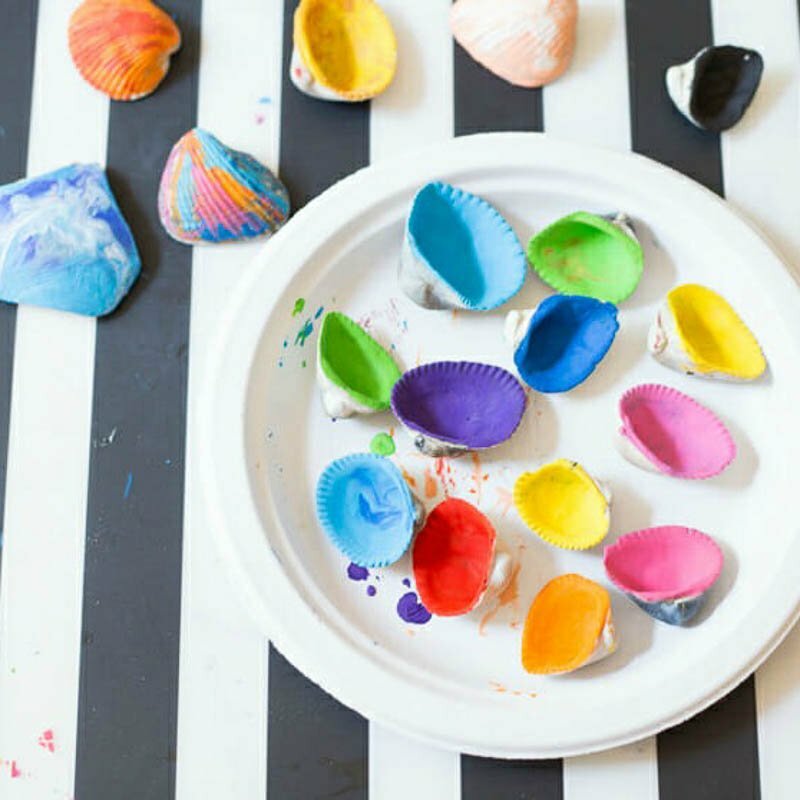 If you’re looking for ways to recycle old crayons into something new or craft projects to do with the kids (or heck, even without them 😉 then look no further. 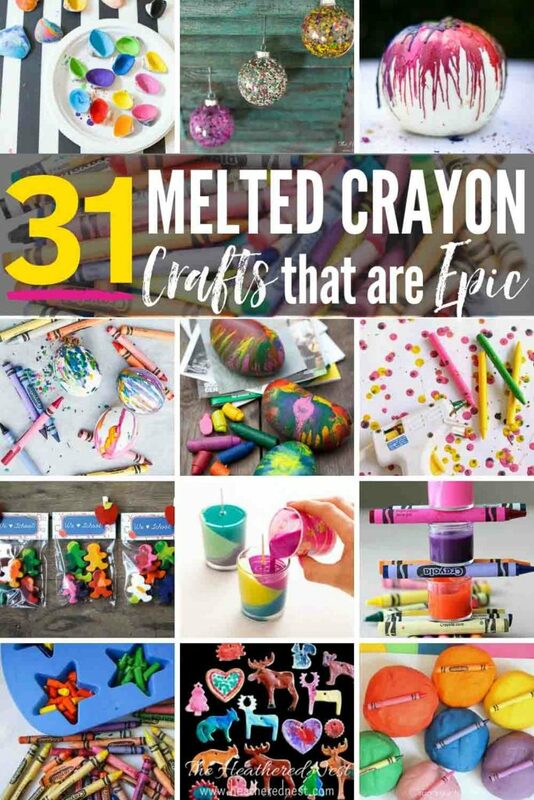 You’ll find 31 super cool melted crayon craft ideas here. Melting Crayons Method #1 – In the oven. Crayons can be melted in an oven set to between 150° (or the lowest your oven will go…ours is 170°F) up to no higher than 200°. At this temperature, crayons in a mold/cupcake tin, etc should melt completely in about 15-20 minutes. Melting Crayons Method #2 – With a hairdryer. Melting Crayons Method #3- In the microwave. Break old crayons into small pieces, or use crayon shavings. Place in a microwave-safe container *with a lid*. Microwave on high for about 1:30-2 minutes, but stop microwave to stir about every 30 seconds or so. Microwaves cook differently, so pay attention to how yours are melting as they could melt slower or faster in your microwave. It’s best to only do a couple of crayons at a time this way rather than a huge batch at once. And try to use pieces that are similar in size, so that they melt evenly/at a similar rate. Melting Crayons Method #4 – On the stovetop. Use or make a double boiler with two pots, one inside the other, or a glass, oven-safe bowl inside a pot. Place water in the bottom pot. Place crayon shavings in the glass bowl, or pot that sits atop the one with water. Heat water to a boil. Stir occasionally with an old spatula. Remove from heat once melted to use for your craft. 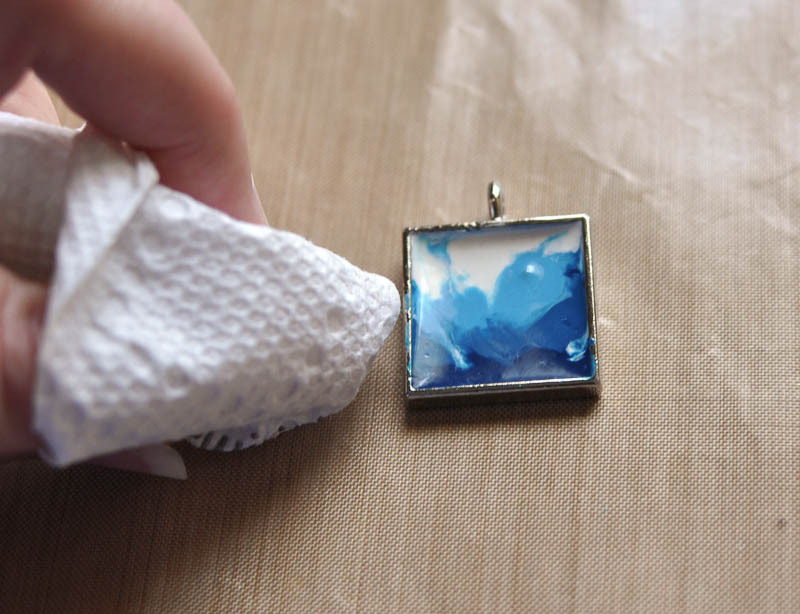 Melting Crayons Method #5 – With an iron. Some crafts, like suncatchers, or the adorable t-shirts (#12 on the list below), call for crayons to be melted using an iron. 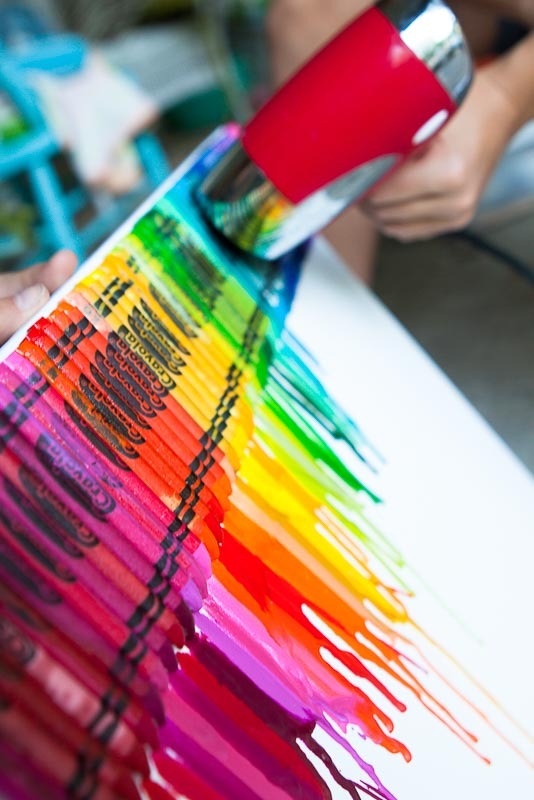 Be sure to protect your ironing board with a rag or old towel before pressing your crayon art project. 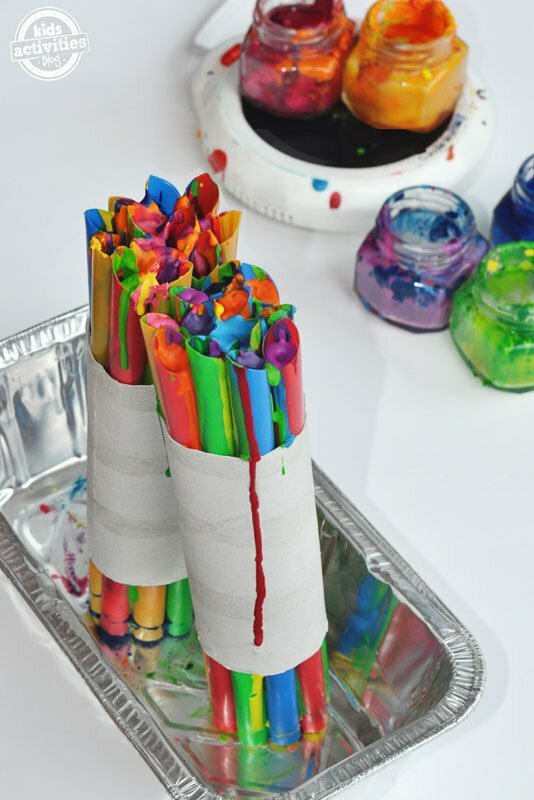 Typically, wax paper will be used to cover the crayon pieces to be melted and serve as a layer between the crayons and your iron. Plain paper or newsprint can also be used atop the wax paper and beneath the iron to help absorb oils as the crayons melt. Start with your iron on the lowest setting, and be sure to keep the iron moving continuously. Check the craft frequently and quickly remove from heat once the crayon is melted to avoid burning the project. If you’ve ever asked yourself, “What are some good ways to recycle/use old crayons?” You’re about to get a very thorough answer! 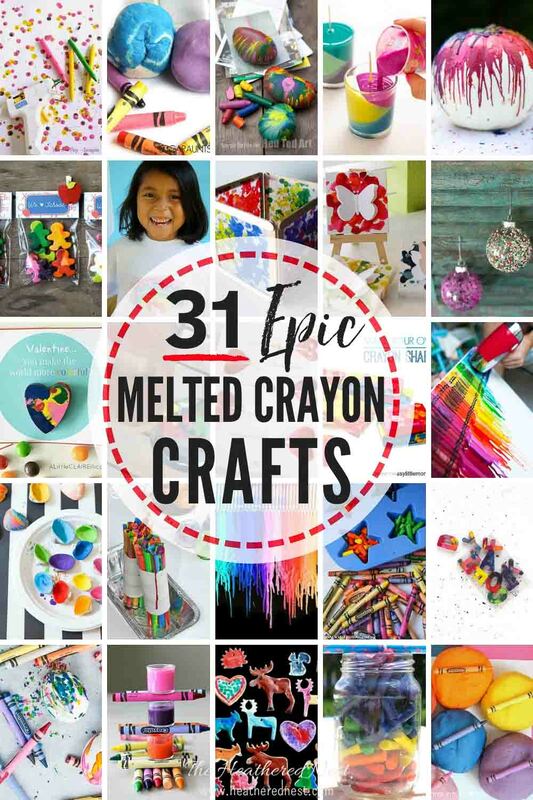 Let’s dive into these awesome and unique melted crayon art ideas! 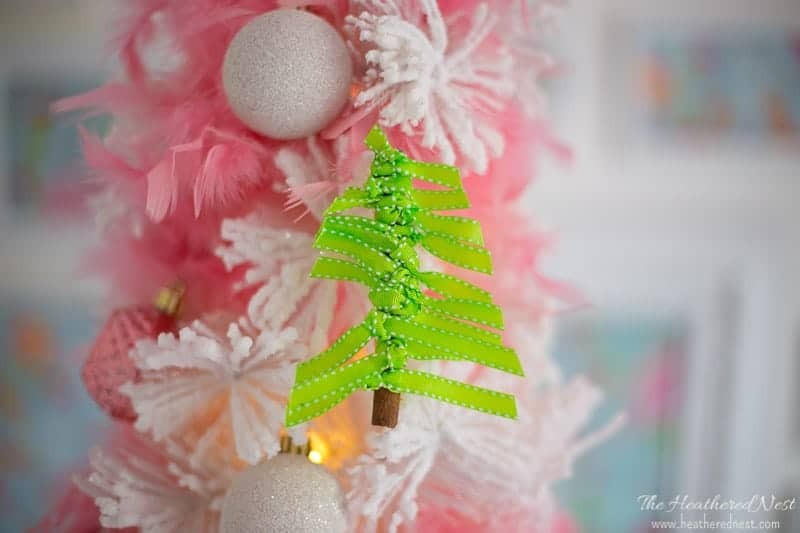 These melted crayon Christmas ornaments are made using a hair dryer, and they are definitely a crowd pleaser. 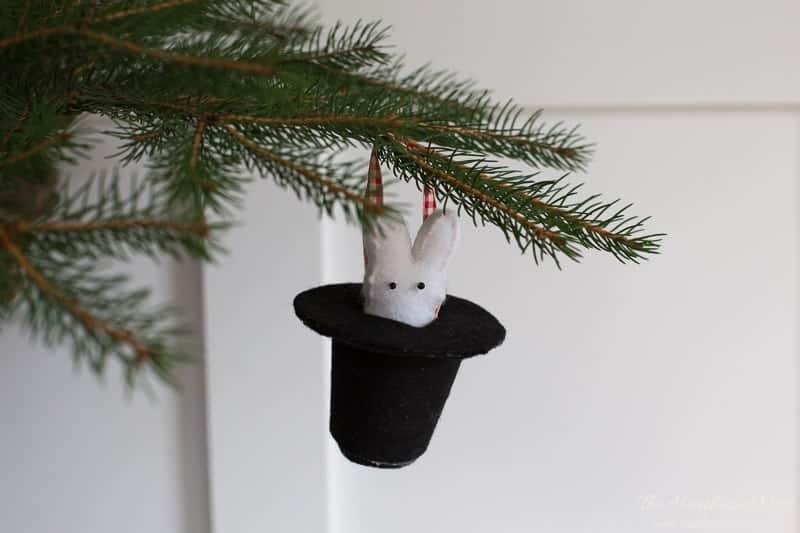 Not only is this DIY ornament idea inexpensive, but it’s also fun, and not really hard to do. My secret to success with this project? A potato peeler. I’m digging this colorful DIY lantern made with crayons and wax paper. This would be a great gift idea for grandparents, Mother’s Day, Father’s Day, etc. Got Lego lovers in da house? What about busted up crayons? 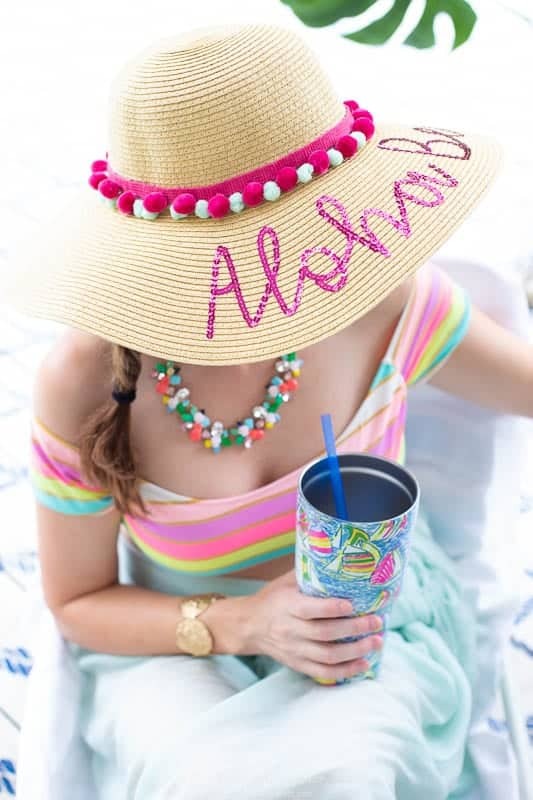 If you have both, then you need to try this fun craft. 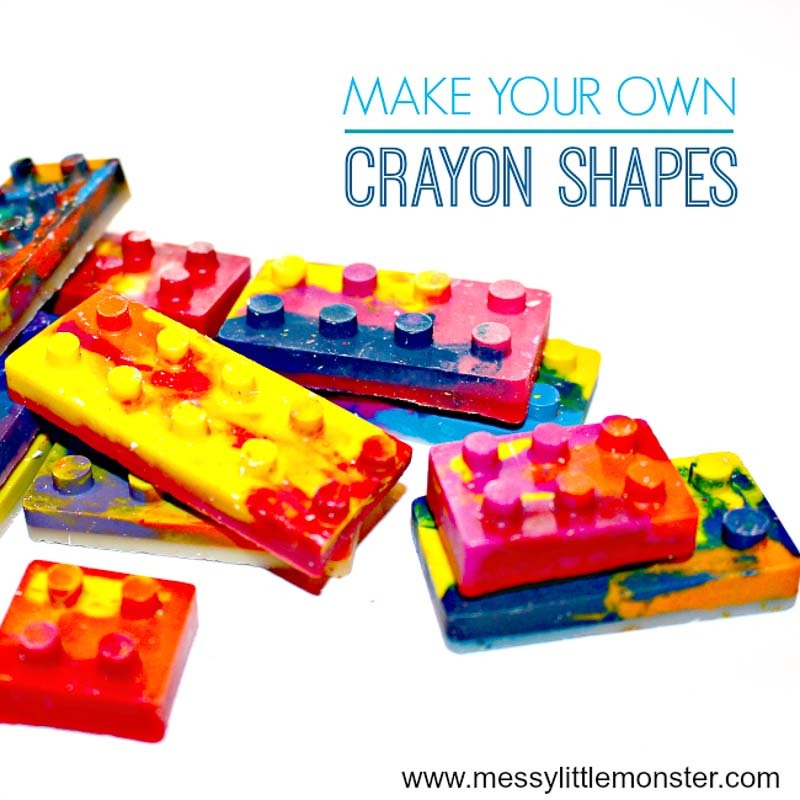 It’s a great way to recycle those old crayons and make your little Lego lover happy as a clam. 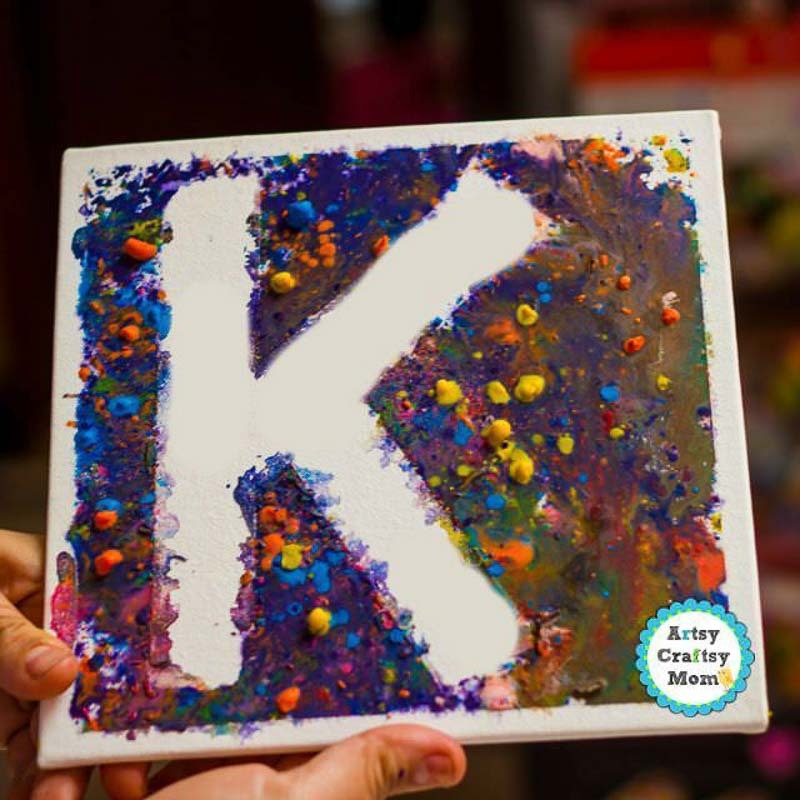 Learn how to create this DIY melted crayon art to highlight your child’s monogram. 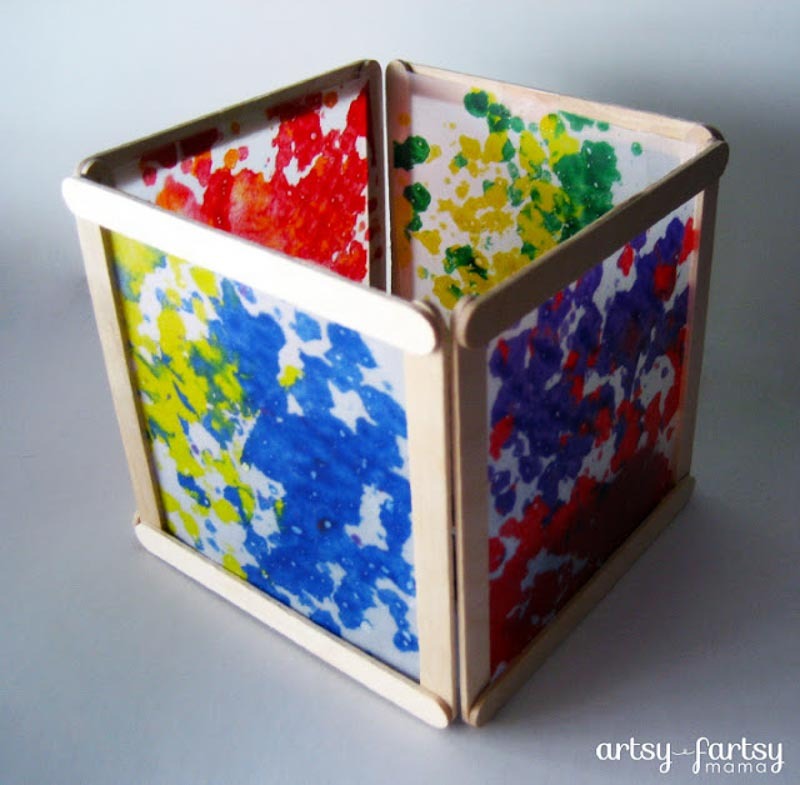 A colorful and inexpensive art project to spruce up their room, perhaps! 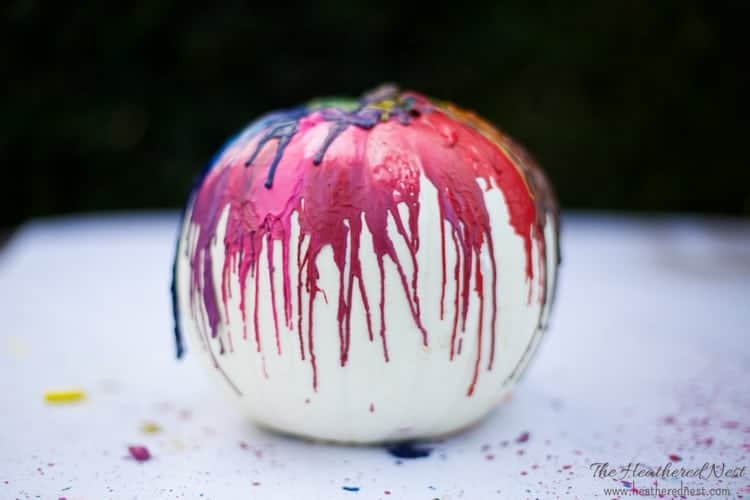 We had SO much fun creating these melted crayon pumpkins in the fall! 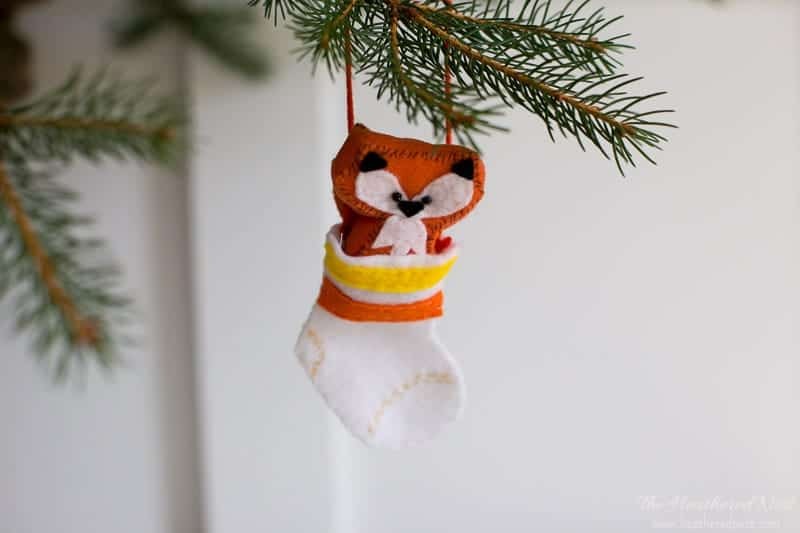 We used the hair dryer method for this craft, and the kids really had a blast creating them. How’s this for a beautiful and brilliant beat-up crayon upcycle? 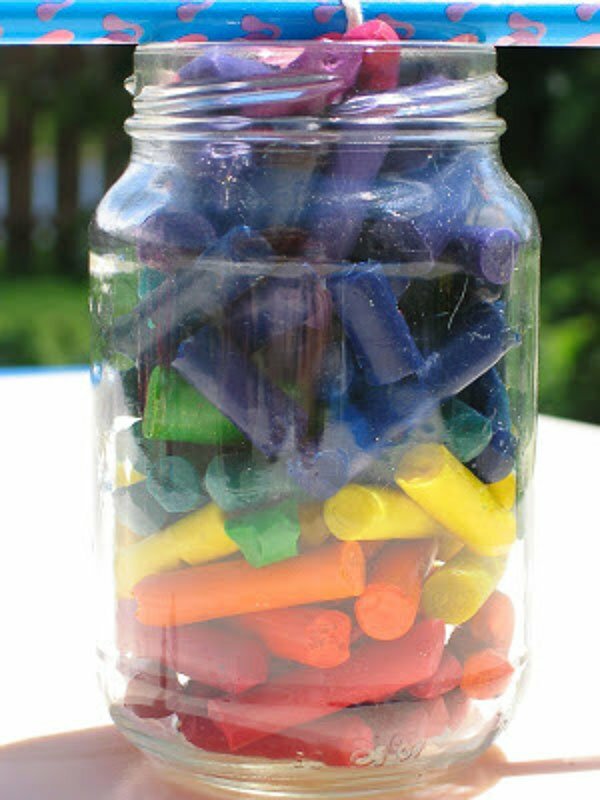 Create a crayon candle in a mason jar. 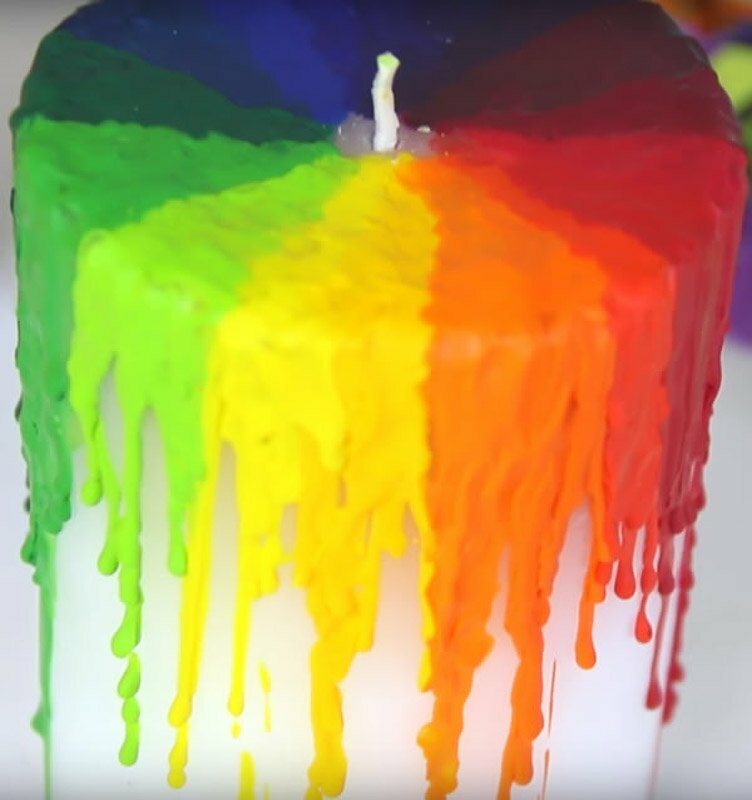 You don’t even need to melt the crayons first, they’ll just melt as the wick is lit. OK, so it won’t smell like pumpkin spice, perhaps…but that crayon scent can sure take you back to your childhood, right? Heck, that scent may be even better than pumpkin spice! Sure, Suzy could definitely sell these seashells by the seashore! 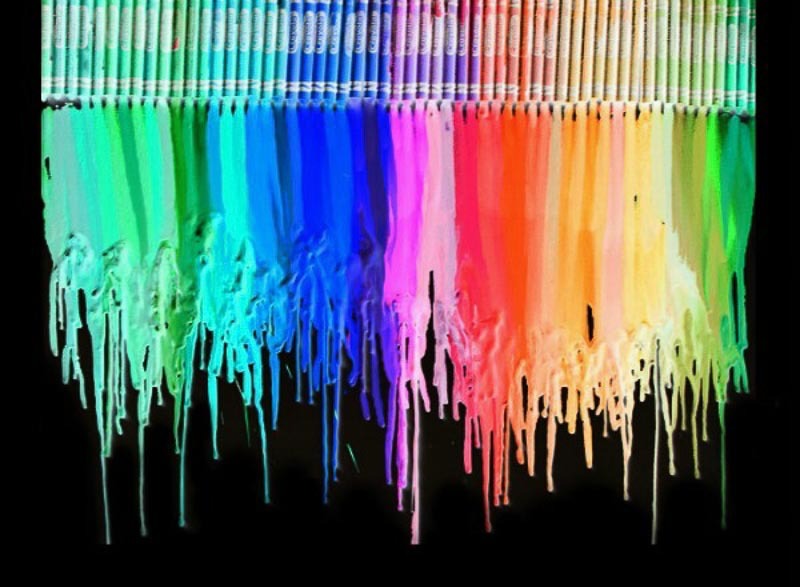 Aren’t they a beautiful melted crayon crafting idea? 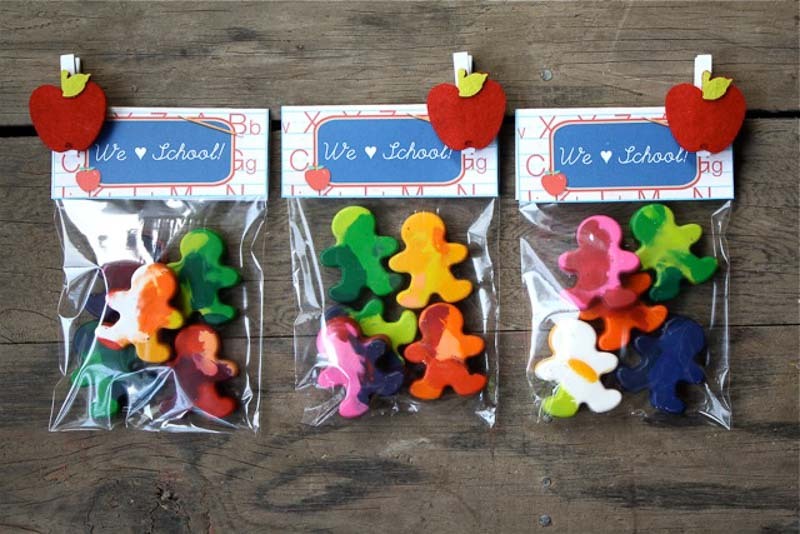 Kids love pencil toppers. And a crayon pencil topper? That’s super cool. You’ll need a special type of form for this craft. Check out the tutorial at Skip To My Lou. 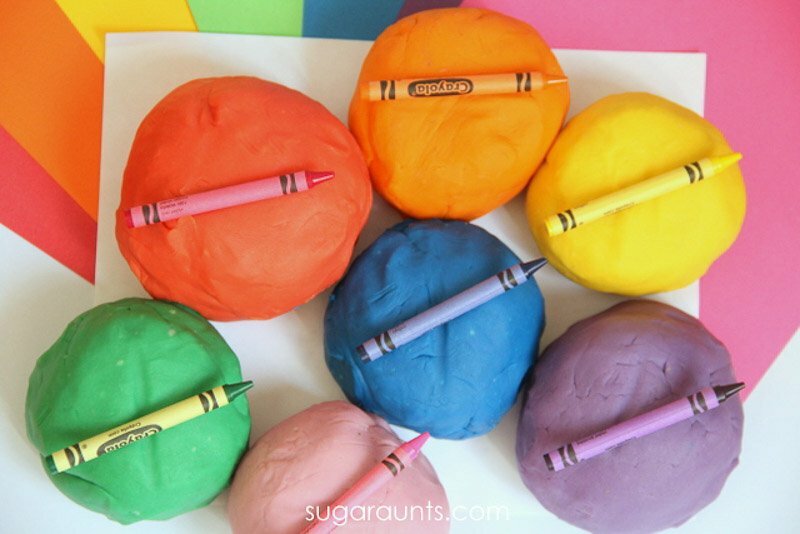 A recipe for salt dough using melted crayons! Then you can roll them out, mark them with a B, and put them in the oven to make ornaments for baby and me 😉 Salt dough ornaments are always fun. And when they are THIS colorful? Even better! Just as cool, but done a wee bit differently, check out another tutorial for salt dough ornaments that go into the oven as plain, uncolored ornaments…then, when they come out of the oven? The crayon magic commences. 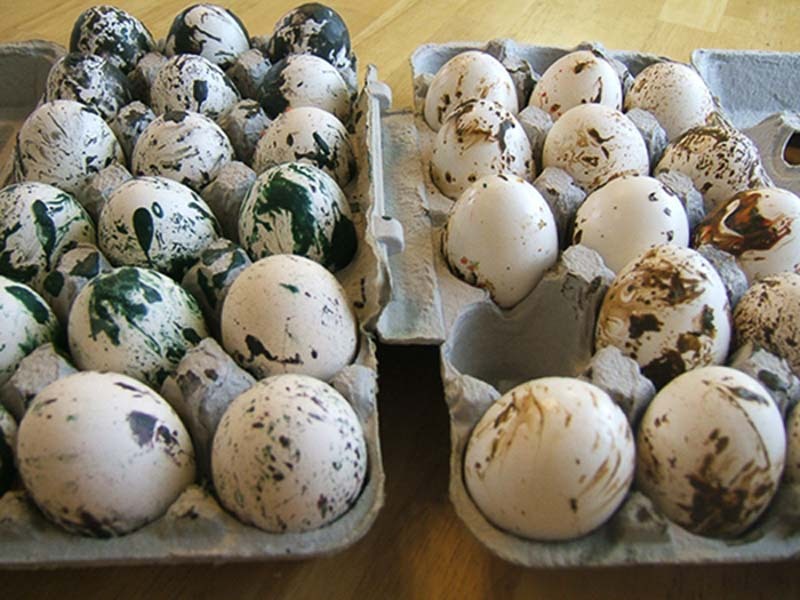 The Thrifty Couple used a unique technique for marbelizing these Easter eggs. And they also give some helpful tips for what NOT to do. Isn’t this the coolest?!?! 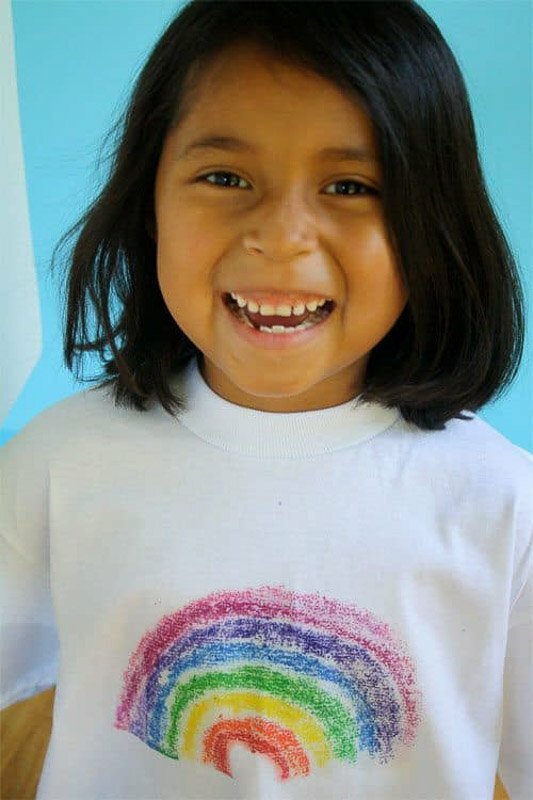 Help your little transfer their artwork onto a plain t-shirt with this brilliant melted crayon art technique. I can’t wait to try this one with my own kids! 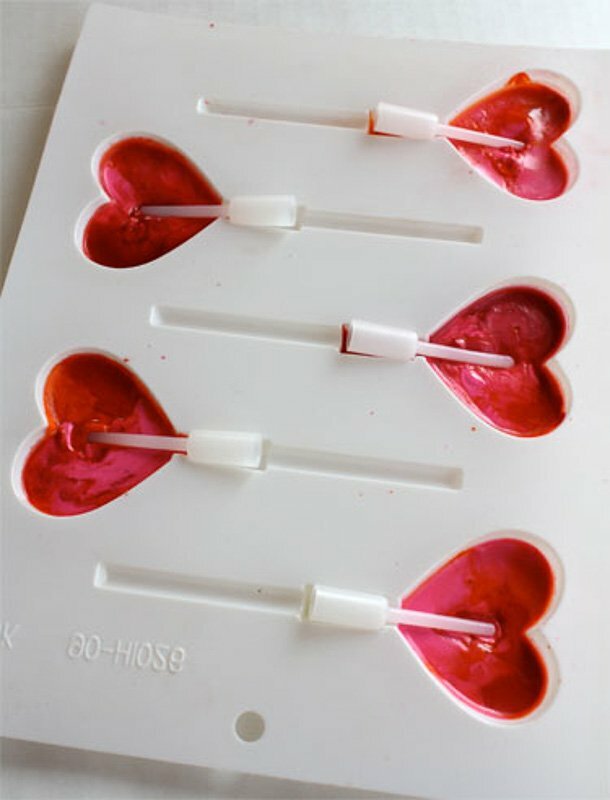 This adorable DIY Valentine idea is so creative. 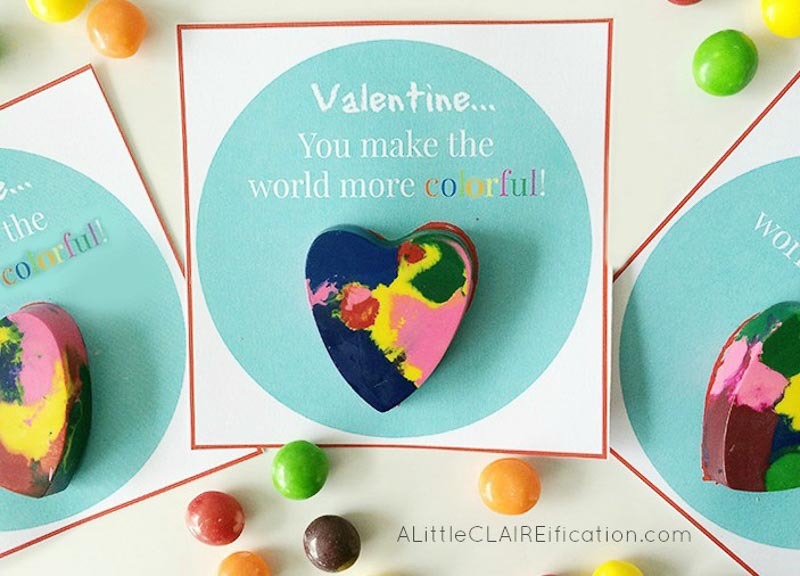 Help your little one make their classmates these cute heart-shaped crayons, then grab the free printable to go along with the crayon heart. 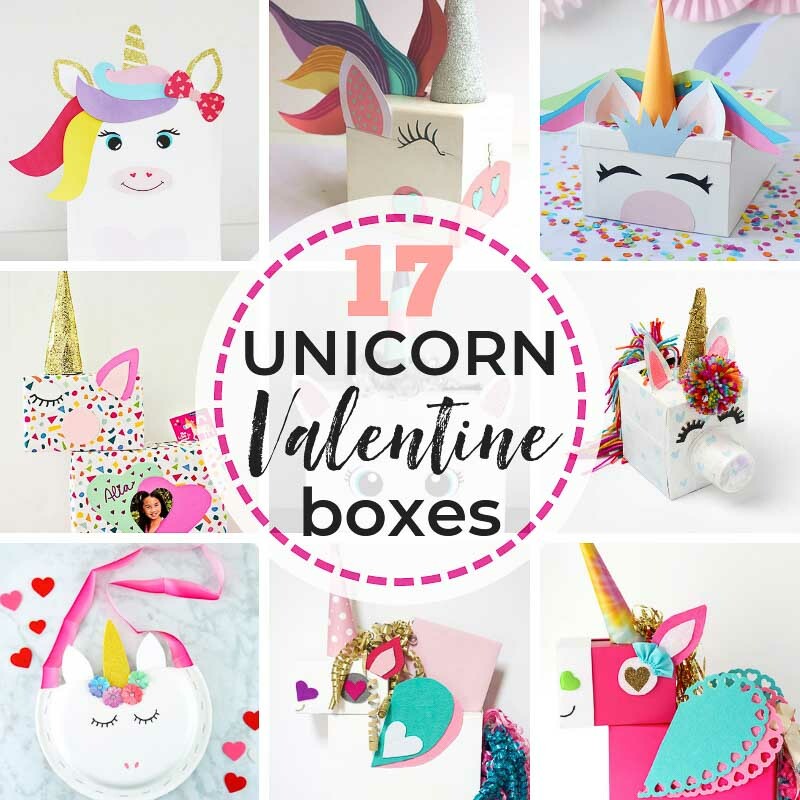 A budget-friendly and very thoughtful DIY Valentine idea! 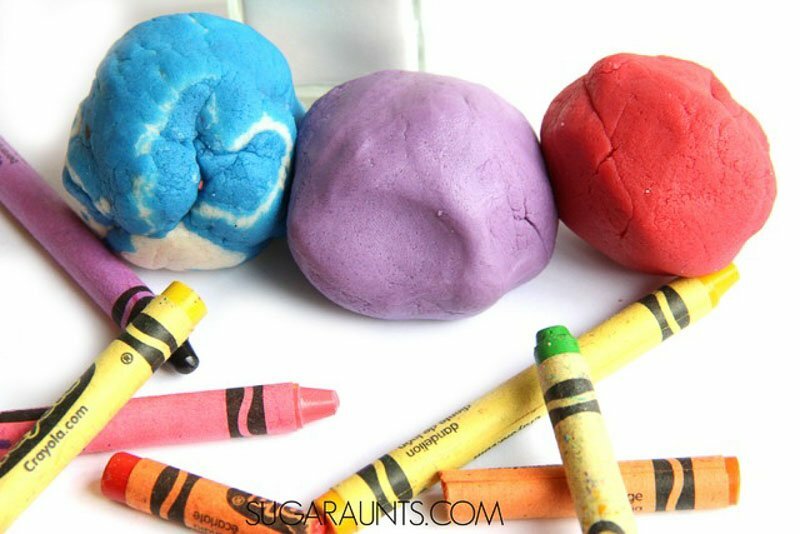 What do you get when you mix crayons with Play-Doh? Childhood nirvana! I mean, this melted crayon idea couldn’t be any more perfect for a child, could it? Try some of these this spring! 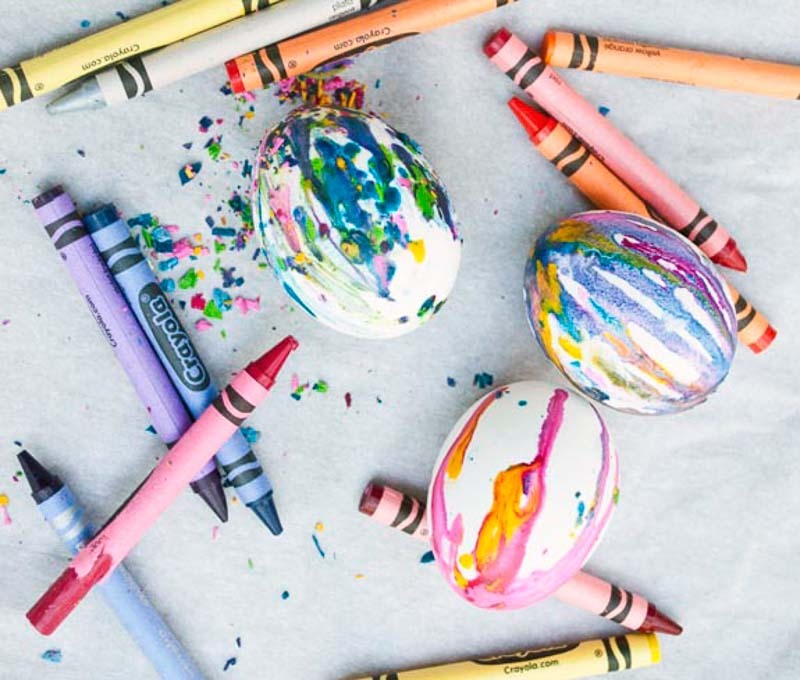 Melted crayon Easter eggs! A colorful riff on a fun holiday tradition. So we’ve all seen these on the internet, right? Have you tried one yet? Me either. But I’m determined to make one of these stunning and thrifty DIY melted crayon canvases at some point in the not too distant future. And a unique spin on the now “classic” melted crayon canvas? How about a neon version? How about this for a fun way to make a boring white candle a standout? Melted crayon projects are like magic, anyhow, so we might as well make a wand, right? 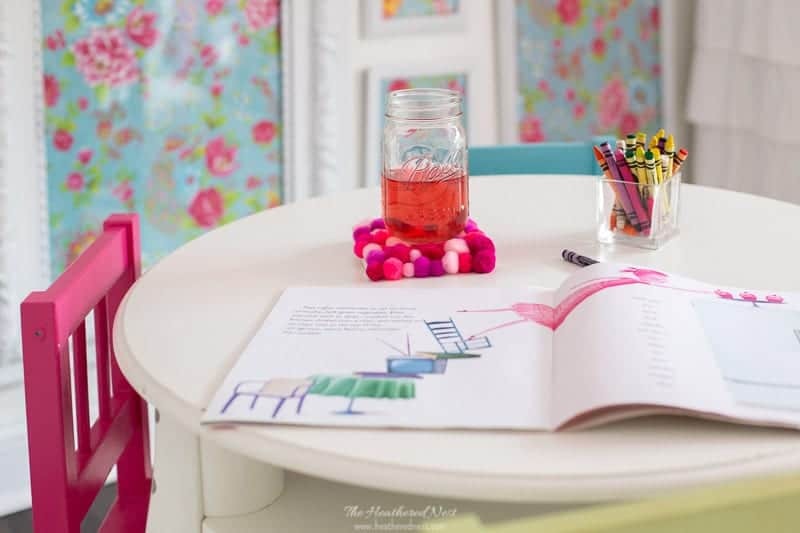 Another cute melted crayon project for kids. 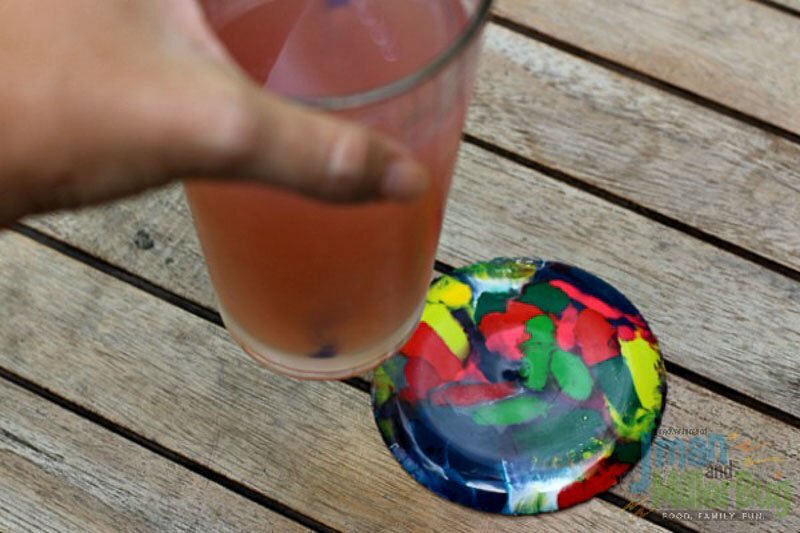 File this idea under “Things I never would have thought of!” Check out this colorful DIY coaster idea! Check out this colorful DIY lip gloss idea! And you make this lip gloss with just 2-ingredients. Easy breezy! 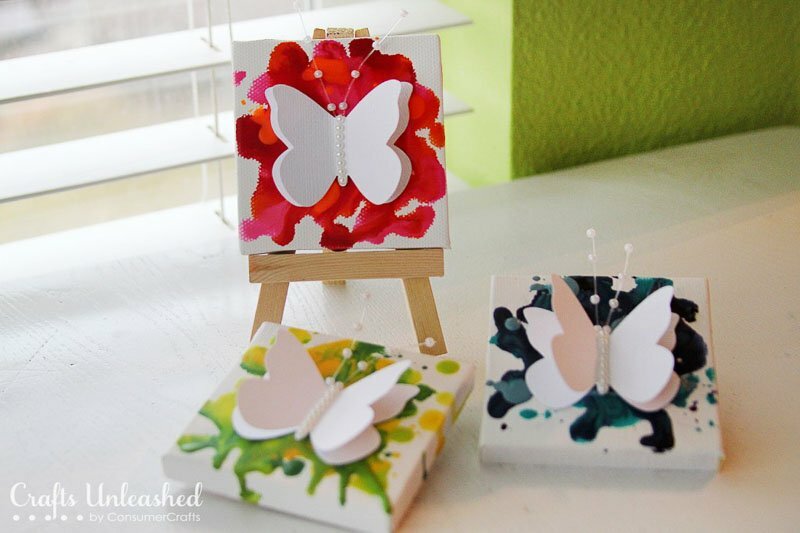 Take a melted crayon art canvas to the next level! Add some 3-D embellishments. 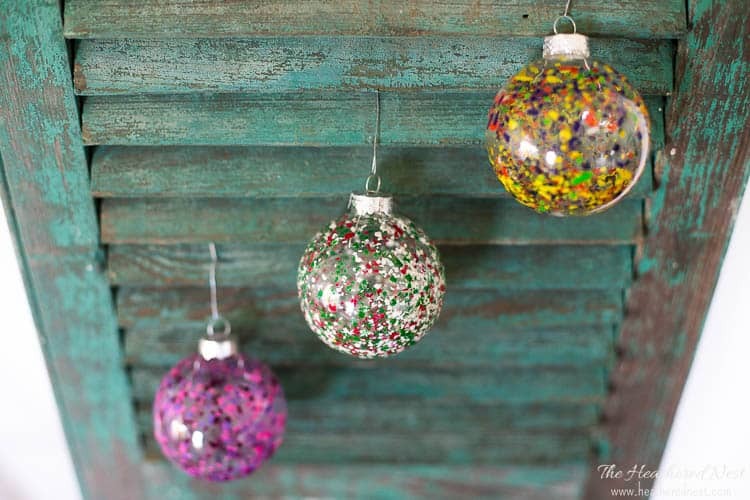 How fun and old world is this little DIY? 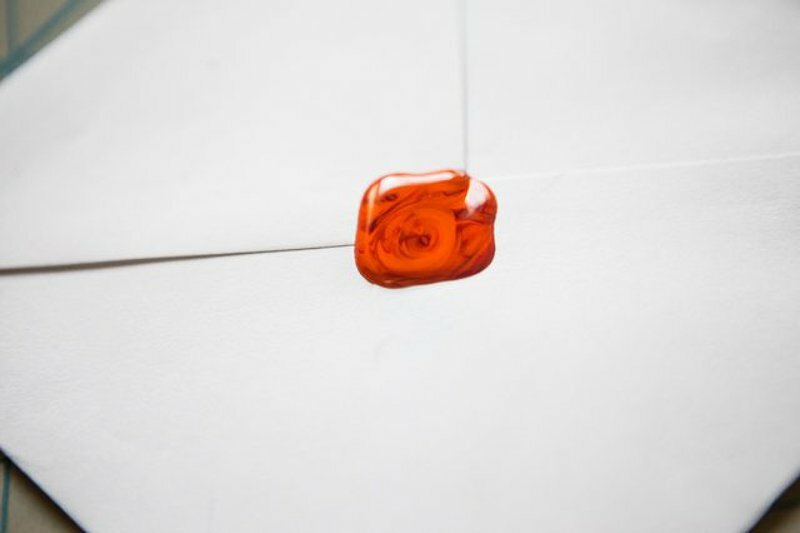 Using melted crayons to make your own fancy envelope seal! 24. 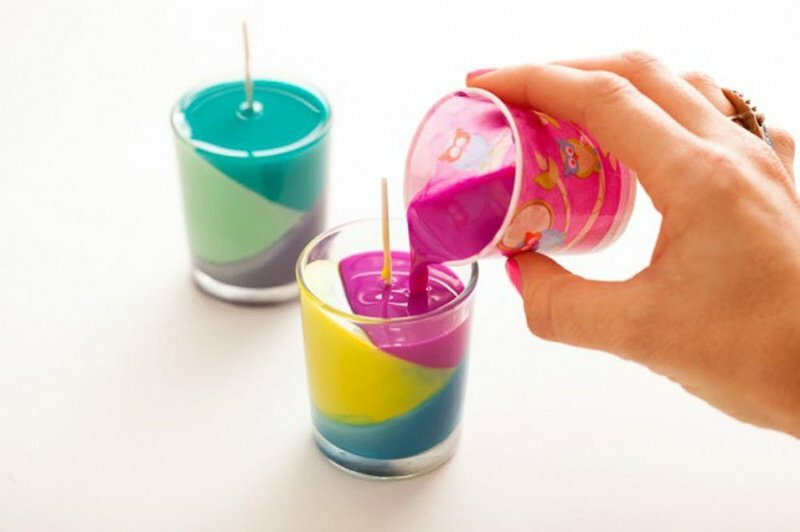 Poured Color Block Crayon Candles | Brit + Co.
Aren’t these DIY color block crayon candles adorable?! 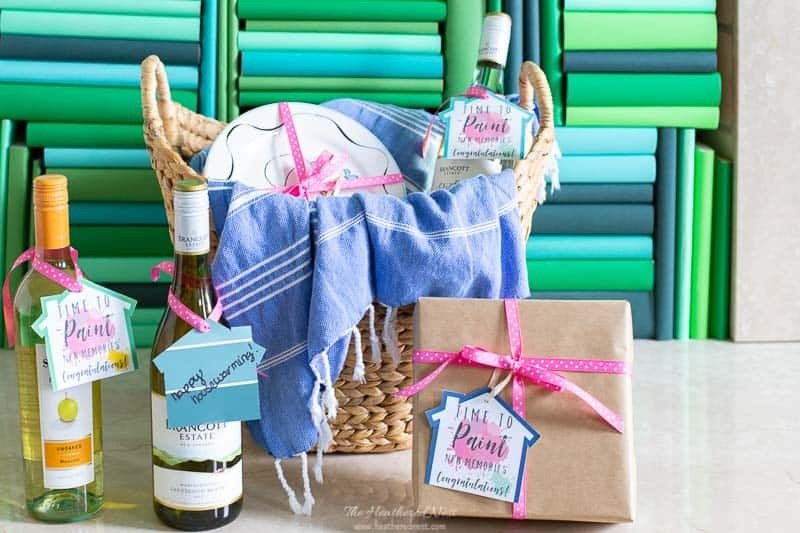 And you could be so creative in personalizing the color combos to make this your own. 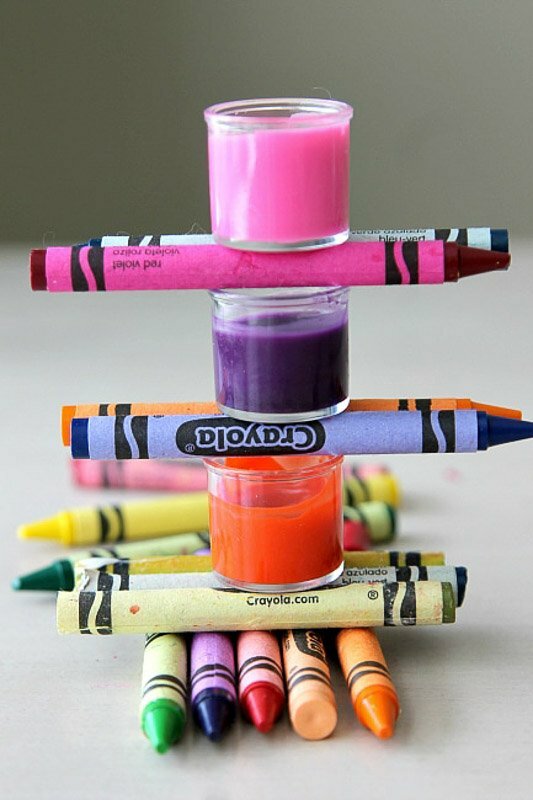 An easy and fun melted crayon project to try, for sure. This idea is so unique. Monica melts down crayons to create custom jewelry! 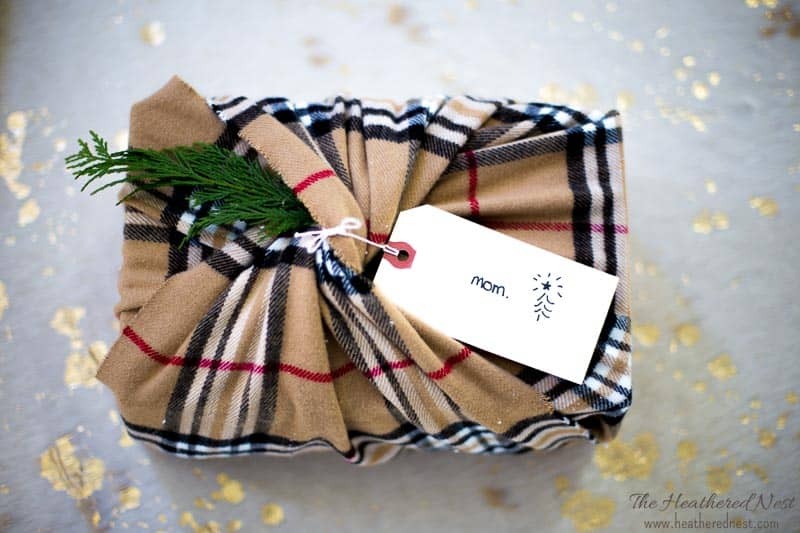 Wouldn’t something like this make a great DIY gift idea from the kids to Grandma? True story…my first business was when I was 6-years old, selling painted rocks in my driveway 😂. 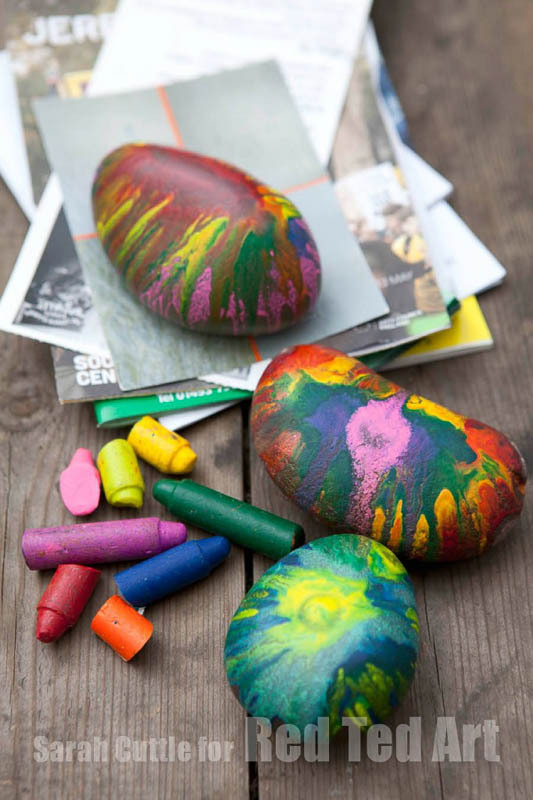 So these awesome hot rocks with melted crayons are a project I love. And not just because they’re pretty, but because it brings me back to my entrepreneurial days of youth 😉. 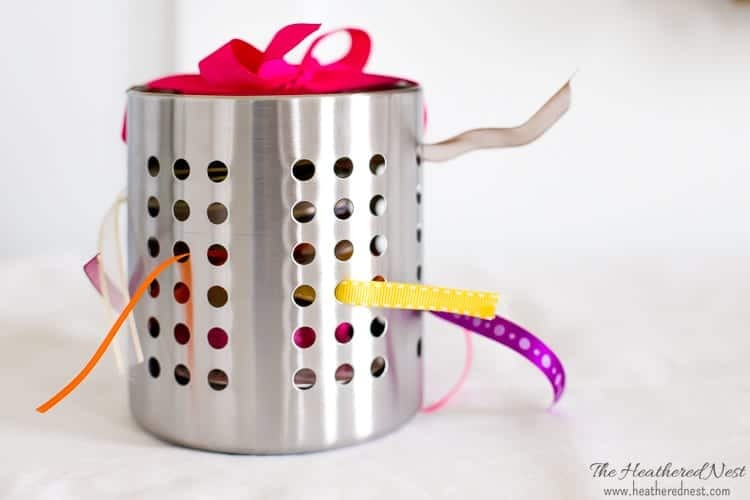 Kids will love trying this project. 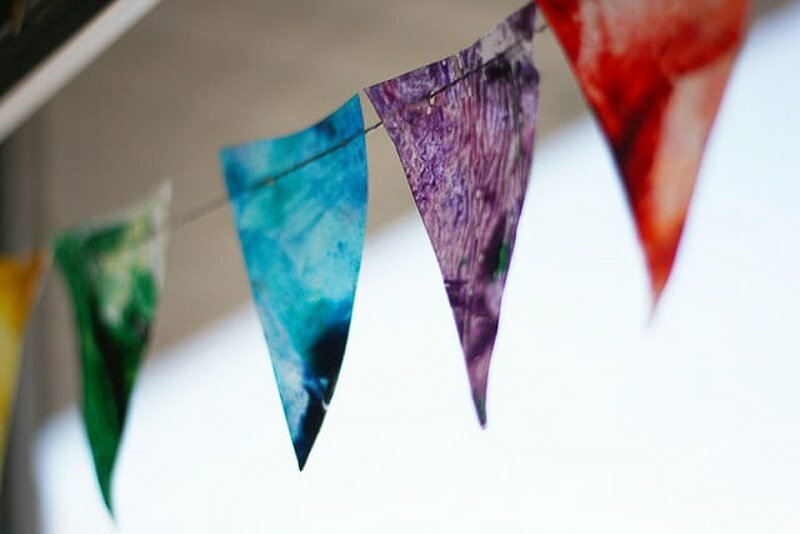 A great riff on a standard suncatcher, make one of these crafty melted crayon banners with a simple tutorial from The Pretty Bee. 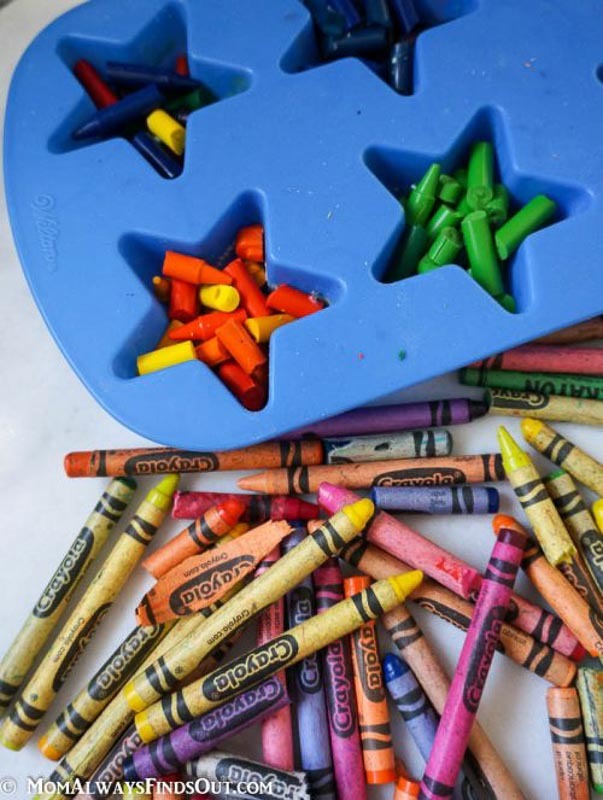 A favorite way to recycle old crayons is to melt them down using different silicone forms, candy molds, etc. This star-shaped melted crayon project is one variety that turns out very cute in the end! What a fun way to learn your ABC’s! 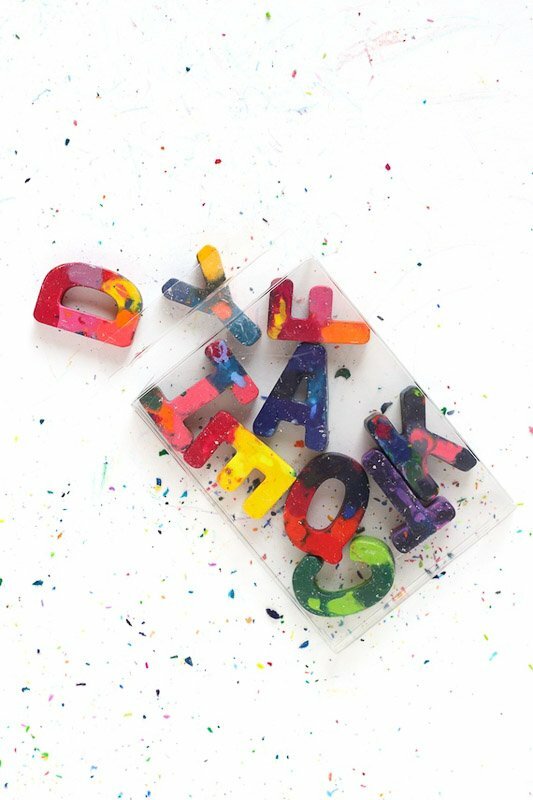 Make some DIY lettered crayons. 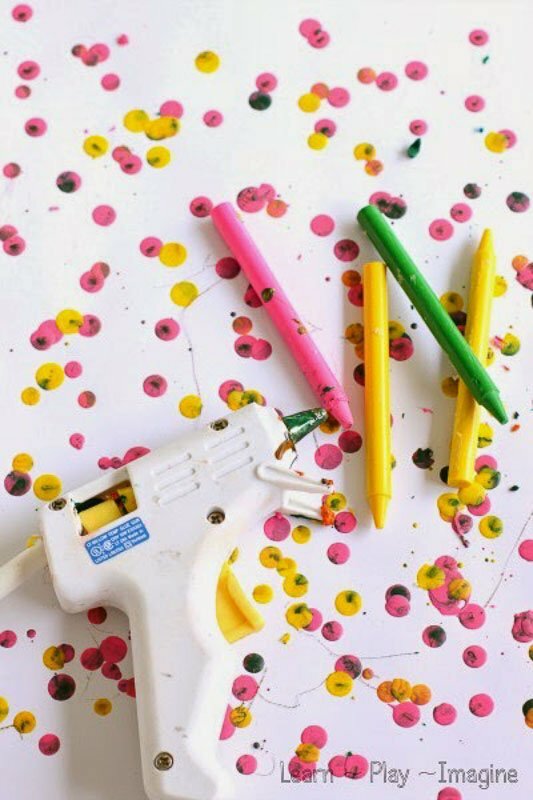 Last, but not least, check out how to make a splatter paint type, modern-artsy melted crayon canvas with this fun melted crayon art technique. A great way to DIY some wall art for a space that’s begging for some more color at home! Pin this post for later! 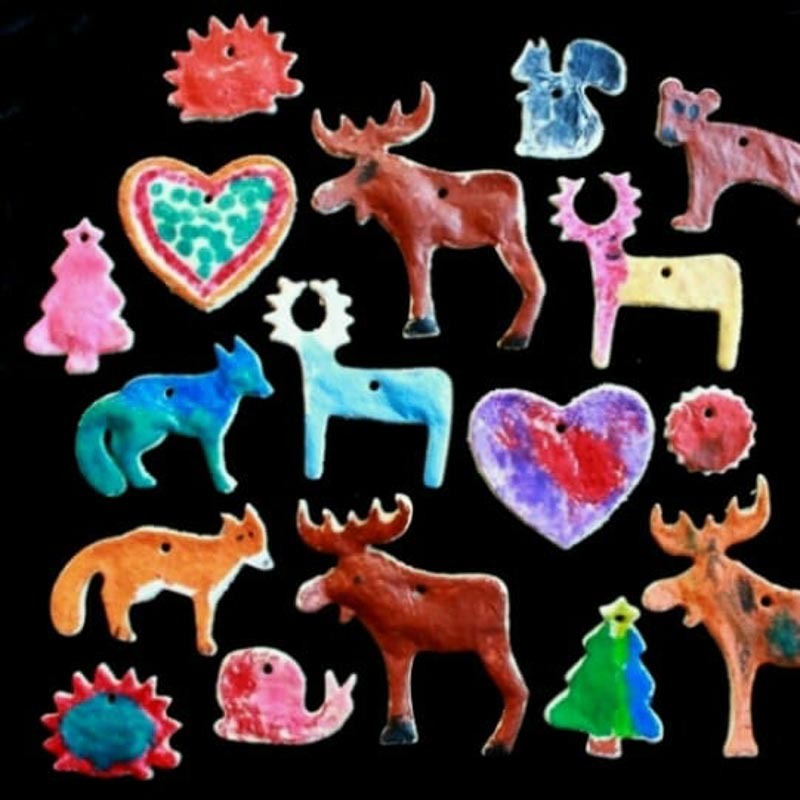 And if you make one of these melted crayon art or craft projects, leave a comment (or better yet, a photo) on the pin! That helps others know whether they want to these, too! « 15 Colorful Homes To Peep 🐣Inside This Spring!